Number 7 is the last upgrade of the OS before the switch to QNX. The OS 7 brings very few new features (NFC and HD video are well worth a mention though) and focus should be on the user experience instead. The new platform is based on a 1.2 GHz processor and more potent graphics hardware, and it’s exactly the higher system requirements that won’t allow older BlackBerry phones to run the new OS 7. Here goes our traditional video demo to warm you up. BlackBerry OS 7 is trying to look like the QNX-based Tablet OS. The UI icons have been updated to mimic the PlayBook, but the rest is pretty much the same - functionality changes are kept to a minimum. The status area of the homescreen has virtual buttons in a row, allowing you to quickly toggle the cellular, Wi-Fi, NFC and Bluetooth radios. It gives you quick access too to the alarm clock and settings menu. Clicking on the loudspeaker icon underneath lets you change the currently active profile, while the magnifying glass on the other side of the homescreen lets you start a search. 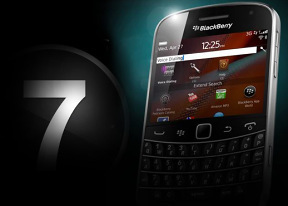 BlackBerry OS 7 is voice search enabled, too. Tapping on a small mic icon next to the Search bar will activate it. By the way, on the homescreen you can initiate a search by just typing something on your keyboard. Missed events - SMS, email or missed calls - can be quickly accessed by pressing the bar between the search and profile icons on the default screen. Below that is the app tray, which consists of several tabs. You can easily hide that completely or lift up one, two or three rows of it with a swipe. The first of the app launcher tabs holds all icons. For convenience, you can sort some of your apps to the Favorite tab. The most frequently used apps are auto generated in yet another tab. There are also Media and Download (for the apps you have downloaded yourself) sections for even more ways of sorting your apps. So, there is a trackpad and there is a touchscreen. The trackpad is the usual sharp and precise navigation option. But with lots of clickable elements on the screen you need to scroll through all to reach the one you need. Pretty much everything you see is clickable in BlackBerry OS 7 and works the way it's supposed to. Sure, there are still small elements such as the homescreen Search and Profiles icons, which are easier to access via the trackpad rather than the touchscreen. The other thing to note is that, unlike the flat iOS layout, the Bold 9900 has a menu button, so usually there are options that are not visible on the screen. You get used to that pretty quickly though so in the end, the Bold Touch 9900 manages to keep both new and returning users happy. Trackpad and touchscreen complete each other in a natural way.